^ a b CoachUp | Box Lacrosse: What is it? ^ a b The Complete Box Lacrosse Goalie by Laurent Gagnier with Robert Reynolds and Dave Butters. Ontario Lacrosse Association. Part III Equipment. ^ Lacrosse Fundamentals by Jim Hinkson. Warwick Publishing Inc. Pg. 139. ^ http://www.ilindoor.com/2012/07/30/former-nll-goalie-and-current-bandits-gm-steve-chugger-dietrich-to-be-inducted-into-nll-hall-of-fame/ NLL goalie Steve Dietrich wears a field helmet (photo). 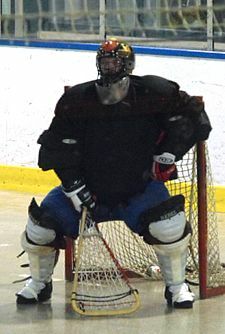 ^ http://www.ilindoor.com/2011/03/24/toronto-rock-legend-bob-watson-to-retire-after-2011-national-lacrosse-league-season/ NLL goalie Bob Watson wears a hockey mask (photo). ^ http://www.lmmlc.ca/docs/CLA_Rules.pdf CLA Rulebook. Canadian Lacrosse Association. Appendix A, Pg. 120. ^ a b Lacrosse Fundamentals by Jim Hinkson. Warwick Publishing Inc. Pg. 137-8. ^ http://www.lmmlc.ca/docs/CLA_Rules.pdf CLA Rulebook. Canadian Lacrosse Association. Appendix A, Pg. 119. ^ The Complete Box Lacrosse Goalie by Laurent Gagnier with Robert Reynolds and Dave Butters. Ontario Lacrosse Association. Part IV Stance and angles. ^ Lacrosse Fundamentals by Jim Hinkson. Warwick Publishing Inc. Pg. 140-3. ^ a b c The Complete Box Lacrosse Goalie by Laurent Gagnier with Robert Reynolds and Dave Butters. Ontario Lacrosse Association. Part VI Advanced techniques. ^ Lacrosse Fundamentals by Jim Hinkson. Warwick Publishing Inc. Pg. 148-59. This page was last edited on 11 July 2017, at 03:19 (UTC).